Catch up on the Nigerian players that were on target for their respective clubs in the European Leagues on Friday, 18th May, 2018. 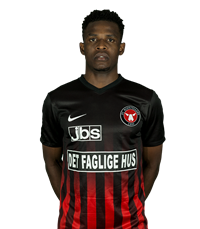 In the Danish Superliga, Frank Onyeka struck his fourth goal of the season for Midtjylland in a 2-0 win over København in a pulsating encounter at the Telia Parken. The 20-year old put his team into the lead after fifteen minutes before making way for Bozhidar Kraev six minutes from time. Janus Drachmann scored the second for the Wolves in the 67th minute to put the game to bed. Hailed as the New N'Golo Kante by the official website of FC Midtjylland , Onyeka spent his formative years as a footballer with cooperative club, FC Ebedei before his arrival at Midtjylland's football academy in January 2016. At the Freethiel Stadion in Belgium, Abdul Ajagun was on target for Kortrijk in a 3-1 victory against Waasland-Beveren in a UEFA Europa League play-off game. The ex-Nigeria U-20 midfielder struck either side of a Jeremy Perbet and Medjon Hoxha effort for the visitors to render Nana Ampomah's goal for Beveren consolatory. The goal was his ninth in all competitions this season.